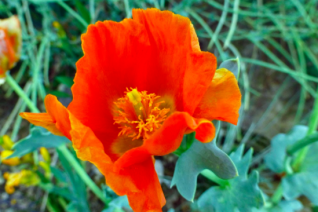 The brilliant ORANGE flowered horn poppy. Variety is the spice of life and we had of course to grow this form of one of our favorite perennials. HUGE true orange flowers are up to 5″ across and they glow from quite a distance. In combination with the blue rubbery foliage- WOW. Full sun and well drained poor to average soil with light to no summer water. Adapts to richer conditions but this will shorten its lifespan. Large blue long “horns” protrude from every direction where a flower was present. Self sows and comes true from seed. Leave the seedling where they are- transplanting this genus can be dicey. 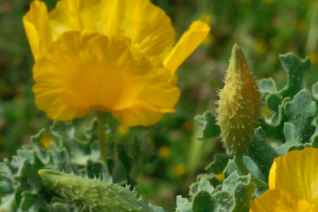 Enjoy it as the feral wildflower that it is. High deer resistance. 2′ x 2′. Dies to a low rosette in winter. Average lifespan: 3-5 years.